Part of the Quartet Prestige 2 Connects accessory line, this convenient marker caddy keeps dry-erase markers and an eraser directly alongside your whiteboard. For a secure hold, use the included detachable hook to attach the caddy to the notches that are built into a Prestige 2 board frame (sold separately). Connect to either the right or left side of the board at any height for an integrated storage solution. 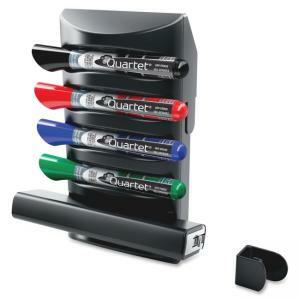 The black caddy comes complete with four EnduraGlide dry-erase markers in assorted colors and one whiteboard eraser. Included EnduraGlide markers are top-performing, liquid ink markers that deliver bold color and dry-erase cleanly after each use. Regular use of the eraser helps prevent board surface from ghosting or staining. Caddy measures 6-1/2" wide x 3-1/2" deep x 8-1/4" high. Combine with other Prestige Connects Accessories for a fully functional, convenient and collaborative work space.